A 52 year old female had an incidental liver mass discovered on abdominal CT scan. The mass was resected and the gross exam shows a 5 cm mass with a central stellate scar. 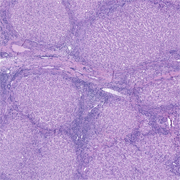 On histologic sections there is nodular overgrowth of normal-appearing hepatocytes. Large vessels are present in the central scar and bile duct proliferation is also seen. 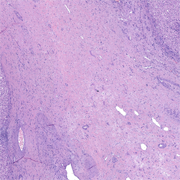 The diagnosis is Focal Nodular Hyperplasia (FNH). FNH is a hyperplastic response of polyclonal hepatocytes, stroma, and bile ductules. The differential diagnosis includes Hepatic Adenoma and Well differentiated Hepatocellular Carcinoma. The presence of biliary epithelium distinguishes FNH from Hepatic Adenoma. 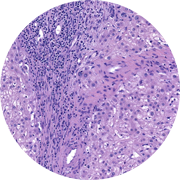 Hepatocellular carcinoma has more pronounced cellular atypia and thickened cell plates.